تقنية سداسية فائق ، خلية مغلقة إسفنج التي تمنح كل الرياضيات أو في أي الاتصال أو التصادمات الرياضي ، تي شيرت مسلسل ملحوظ مزايا الحماية والمتانة ثقة. My eleven year old bought this for his surprisingly physical travel team games, and I'm so glad he's got it because as his mama I was doing a lot of cringing. The small mens is a bit large on him (he's wiry), but he also has this brand's knee pads, and we've been impressed with both. We've tried other brands, and many of them rip on the second or third fall. This brand has been the best so far. A few games ago he dove for the ball, slid across the floor on his knees, and rolled into the bleachers. No rips! Thanks, McDavid, for padding my child and making him feel cool at the same time. If these products looked like his mom had bubble wrapped him, there's no way he'd wear them!! I don't have arms like that illustrated above, though I do work out. Probably anyone who would purchase this product is into conditioning of some sort, and wouldn't have matchstick arms. I measured my elbow as suggested and ordered a large, falling into the lower range for elbow circumference for that size. There is no size indication on the product, only on the plastic packaging. It said large. I was so excited to receive this because my current elbows pads have grown loose from use and slip down as I rollerskate on the street. This was like a terrible joke. I couldn't get the sleeve past my forearm, let alone my elbow. If this indeed was a large, then leave this product for children. This large was so ridiculously small. I'm using this following an ulnar subluxation. My nerve is displaced and very sensitive. The padding on this sleeve is thick enough to help cushion the nerve when the inevitable bumps of my day occur. The sleeve is a slick fabric and slides under normal clothes easily, despite the padding - I can wear a long-sleeved T over it. It also keeps me a little warmer, which is great since it's freezing out! The padding feels really cool - the hexagons are not joined, so they move easily, and they have a texture that is fun to squeeze. I love that it came in a bright pink, too - if I'm going to have to deal with an injury, I might as well embrace it! 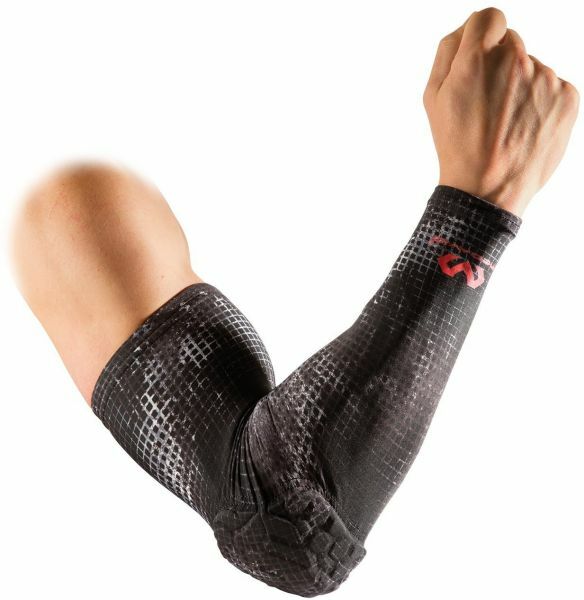 Got these to protect my elbows while suffering from tendonitis. The hexagonal padding does a great job of molding to your elbow shape...a big plus over others! Be forewarned however, they are very long, I'm 6'6" with long arms, and the sleeve goes from my wrist to the top of my bicep. It can get a little uncomfortable on my upper arm, so like most guys wearing them, I tend to roll the top down an inch or two, then it's much more comfortable. All in all a really quality elbow protector.